Big Island residents are watching in horror as a lava flow from fissure 8 creeps steadily closer to a popular and beloved boat ramp in Pahoa. Hawaii News Now. Lava flow from fissure 8 may go on for months or years. That’s the conclusion of a recent U.S. Geological Survey report prepared for Hawaii County Civil Defense. Star-Advertiser. 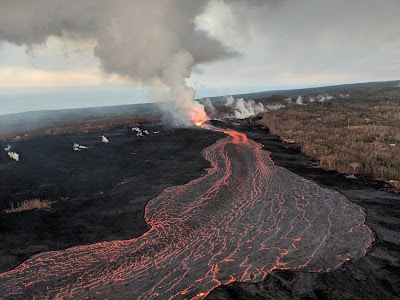 The eruption of Kilauea Volcano along the lower East Rift Zone, which scientists said could last for “months to years” in a new report, continues. Big Island Video News. Turtles, marine life found dead in Pohoiki after lava approaches area. Hawaii News Now. Passengers Recount Moments After Lava Hit Tour Boat. A couple from Portland who both suffered burns still managed to shoot video of the mishap. Associated Press. Credit for affordable housing sparks political clash. Congresswoman Colleen Hanabusa, who is seeking to beat Gov. David Ige in the Aug. 11 Democratic primary, has accused the governor of taking undue credit for the $200 million in funding, saying that it’s the Legislature that should be applauded. Star-Advertiser. Political Analyst Dan Boylan on Congressional District One Race . Hawaii Public Radio hosted a Congressional District One Candidate Forum Sunday Night and asked a political analyst to evaluate the race. Hawaii Public Radio. Bank of Hawaii Corp.’s second-quarter net income totaled $54.7 million — $1.30 earnings per share, a record high for the state’s second-largest financial institution. Star-Advertiser. HPD Hopes Body Cameras Will Reduce Confrontations — And Lawsuits. At a cost of $3.5 million, Honolulu will equip all its officers with body cameras during the next year — following a step taken by many large urban departments. Civil Beat. HDOT moves forward with $69M renovation project at Honolulu airport. Officials announced the completion of several parts of a $69 million renovation project in the Daniel K. Inouye International Airport on Monday. Hawaii News Now. New bill could set up future bikeshares to come to Honolulu. The new City Council proposal sets up a permit process with rules to follow, which could open the door for more bikeshare companies to do business in Honolulu. KHON2. Familiar Faces Return For Another Run At State House Seats. Former legislators try to regain their seats in Waianae and Ewa, while a candidate who narrowly lost in 2016 runs again in Manoa. Civil Beat. 5,000 soldiers participate in Army activity. While naval forces are at sea for Rim of the Pacific, the Army is holding its own big exercise, with lots of troops on the ground, military vehicles on the move and helicopters in the air as they practice against what are known as “near-peer” competitors. Star-Advertiser. An eight-person crew from Oahu Junk Removal began clearing out tons of metal, rubbish and overgrown foliage from a Pensa­cola Street property, where a fourth vehicle was unexpectedly discovered among the debris Monday. Star-Advertiser. Two Native Hawaiian practitioners no longer face charges for illegally taking the remains of a small, ailing whale the pair watched over before it died and burying them at sea off Kawaihae. Associated Press. Safeway to take over old Sports Authority location in Waikele. Safeway has signed a 20-year lease for approximately 50,000 square feet in the former Sports Authority space at Waikele Center in Waipahu. KHON2. Safeway Inc. will open its first grocery store in Waipahu next year in the former Sports Authority space at Waikele Center. Star-Advertiser. USS Arizona Memorial won't be accessible to visitors for a couple more months. KITV. Hawaii island police have identified four more suspects who may have provided assistance to accused cop killer Justin Waiki before he was gunned down by police in a shootout in Kau Friday. Star-Advertiser. The manhunt that started when Officer Bronson Kaliloa was fatally shot and culminated with officers shooting and killing the suspect, Justin Waiki, “took up a lot of resources,” said police Maj. Robert Wagner on Monday. Tribune-Herald. A preliminary hearing has been scheduled for this afternoon for three individuals charged in connection with a shootout Friday at South Point that left a Hawaii Police sergeant injured and suspected cop killer Justin Waiki dead. West Hawaii Today. Court documents show Waiki's accomplices used Facebook to avoid cops. Four people allegedly involved in the manhunt for Justin Waiki appeared before Judge Margaret Masunaga in Kona Monday. KITV. Hawaii County government has cleaned up its act regarding its pCard use, according to a report to be discussed today by the County Council Finance Committee. West Hawaii Today. Hawaii to receive $3.5M in federal grant funding for clean-up efforts on Big Island. Pacific Business News. Officials announced on Monday that families displaced by the ongoing volcanic and seismic activity in Kilauea will soon be eligible for food assistance from the state. Hawaii News Now. Seismic activity causes cracks to form in surface of Highway 11 passing through national park. Tribune-Herald. Water department requests power cost charge increase despite renewable energy to spare. West Hawaii Today. Candidates jockeying to win a position on Hawaii’s 2018 general election ballot say at least one Big Island newspaper is requiring them to buy an ad if they want to be included in the newspaper’s primary voter’s guide. Civil Beat. $4 M in Grants Released by Maui Economic Development Office. Maui Now. Volcano dogs: Looking for new homes after Kilauea. Pups displaced by the ongoing eruptions on the Big Island in need of new forever homes on Maui. Maui News. Animal rescue groups and volunteer pilots are finding new homes on Maui for dogs displaced by the Kilauea volcano eruption on the Big Island. Associated Press. A protest of one stopped the state’s preliminary work on a North Shore bridge Monday morning. Garden Island. Makaala Kaaumoana, chairwoman of Hui Hoomalu i kaaina, said there is another issue that could delay North Shore bridge work. Garden Island. County officials announced that refuse collection services for residents affected by the April flood in the Wainiha and Haena area will continue. Garden Island.